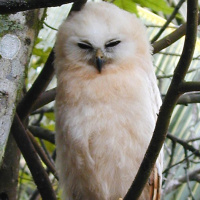 The Rufous Fishing Owl is a fairly large owl with no ear-tufts. Distribution: Endemic in western Africa from Sierra Leone and Guinea east to Ghana. Unconfirmed reports from Nigeria. Original Description: Sharpe, Richard Bowdler. 1871. Ibis, 3rd Series, vol. 1: p. 101, pl.12. Page by Deane Lewis. Last updated 2015-10-28.